Conviva’s 2018 State of the Streaming Industry report shows an acceleration in the adoption of streaming media. Connected TVs, vMVPDs, news, and sports are key drivers of the trend. Conviva says it saw viewing hours grow 89% between 2017 and 2018. Fourth quarter growth was even higher, increasing 165% over Q4 2017. Similarly, video plays grew 74% year-over-year and 143% Q4-over-Q4. Conviva highlights three main areas driving the growth. The early running in streaming media was dominated first by the PC and then by mobile devices. Today, the connected TV is firmly in charge. Conviva says that video plays at the connected TV increased 148% in 2018 over the previous year. Mobile device plays increased by 94%, and the PC saw a scant 1% growth. Roku and Amazon Fire TV have been running neck-and-neck, with penetration of Wi-Fi households for each hovering around 20%. However, Conviva says Roku is way out in front when looking at the share of viewing hours. 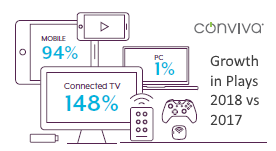 Overall, the connected TV received 56% of total streaming hours for premium video in 2018. Of that time, Roku devices accounted for 41% and Fire TV for 18%. Since Roku and Fire TV have roughly the same penetration, the data suggests Roku users stream more than twice as much video as Fire TV users. In its Q3 financial disclosure, Roku provided data which suggests active Roku users stream about 3 hours per day through their device. The Conviva data suggests Fire TV users stream a little less than an hour-and-a-half per day. Conviva counts 4 of the top 5 U.S. vMVPDs as customers, so it is well placed to track growth in usage of the services. Kagan estimates that all U.S. vMVPD providers gained 2.1 million subscribers in the last three quarters of 2018. Such strong growth caused vMVPD viewing hours to increase 74% faster than video publisher apps. As well, the average minutes per play was much higher than for publisher apps, 25 minutes per play versus 14 minutes. As might be expected, the connected TV is the principal viewing location. Connected TV devices accounted for more than three-quarters of all viewing hours. Conviva says that vMVPD customers are also getting a more TV-like experience than other streaming customers. Every major measure of quality was better for vMVPDs. For example, 0.95% of video starts failed for vMVPDs compared 1.33% for all U.S. streaming. 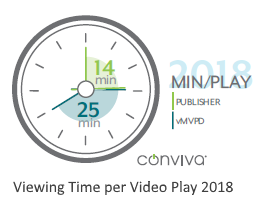 According to Conviva, live streaming hours grew 65% between 2017 and 2018. News and sports were the two key categories driving the increase. Midterm elections in the U.S. caused a huge spike in news streaming. Live news traffic increased 217% on November 6th in the U.S. and 14% globally. Other notable news events included the Supreme Court nomination hearings for Brett Kavanaugh and the coverage of the passing of President George H. W. Bush. Conviva also notes that news viewing peaks during the week while all streaming traffic peaks on the weekend. People appear to be using their phones to keep up with the news when at work and out-and-about. There was an 82% increase in live viewing hours to mobile compared to an increase of 69% to connected TVs and 41% to the PC. The Olympics and World Cup helped boost sports live streaming in 2018. The Olympics drove a 26% increase in global viewing hours during the event while the World Cup drove a 12% increase. Even the U.S. centric NFL drove viewership spikes as high as 15% in live streaming on Sundays during the season. Consumers continue to transition more of their viewing time to streaming media. News and sports are driving live streaming consumption. The connected TV is increasingly the device of choice for video streaming viewing. vMVPDs are beginning to drive substantial growth in the U.S. market.